Raising awareness of your topic or niche by using content is the perfect way to position you as an expert in your field. You can deliver information that can really build recognition of your brand and display your knowledge in easily digested methods. 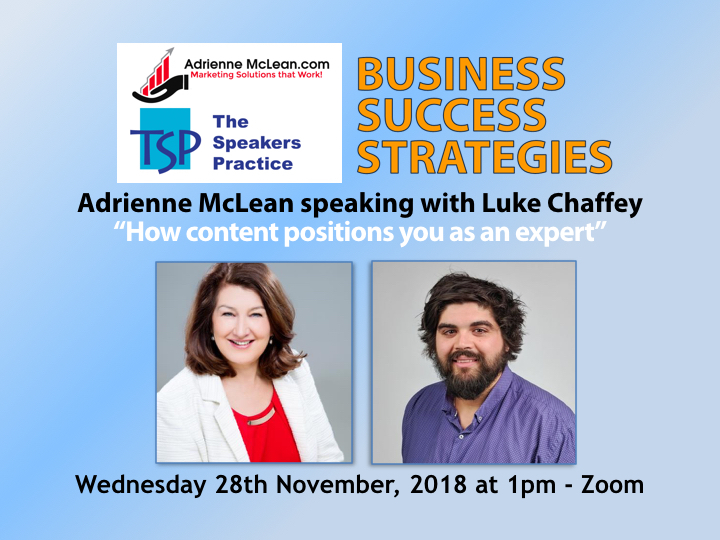 Here’s the Business Success Strategy interview with Luke Chaffey, Kochies Business Builders – Digital – Luke really goes into detail about the benefits of creating content, how to create content that connects and discusses problems that your audience faces. There is really “meaty” information right through the interview so get a cup of tea and spend 30 mins listening to Luke’s approaches and information. Adrienne McLean, a Business Development coach who helps professionals to get more clients, move forward and build confidence to get the sales flowing in. Ring Adrienne McLean on 0414 367 960 or email on adrienne@adriennemclean.com for more details.